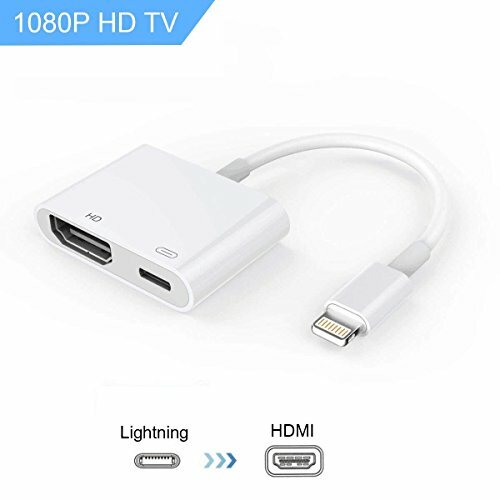 ✅ Full 1080P HD display: The adapter supports mirroring of what is displayed on your device screen to your HDMI equipped TV, display, projector or other compatible display in up to 1080P HD. ✅Plug & Play: No need to install any APP, and no need personal hotspot. Just use an extra lightning cable to power adapter to charge, then click the "Trust" button when connecting and then wait it to connect automatically. This cable can also support Lightning ➪HDMI ➪ VGA. ✅Support: Okko movies,Youtube, Česká televize.NOT SUPPORT:Netflix, Google Movies, Amazon Prime Video, Yomvi, Line TV, Popom Time, CBS CNNGO, BT SPORT, SBS, Periscope, Tonton, Iflix, IPTV, Hulu,Unext, DTV, HBO Go, Molotov.tv , Sling Tv, Xfinity, PTCL Smart TV, TSN Go, Workout, Fox Sports Go, ESPN, Hbonow, SlingBox, Fubo TV, Vudu, Foxtel. ✅Easy To Carry: With light and small design, it is very convenient to carry and connect your iPhone/iPad at anytime to a projector for home entertainment, business meetings, education, training and etc. If you have any questions about this product by soloer, contact us by completing and submitting the form below. If you are looking for a specif part number, please include it with your message.